Taylor Swift over the past few years has transformed herself into a global pop megastar. However, there was a time where she was just a curly haired girl strumming a guitar and writing simple love songs. The music video to “Everything Has Changed” is a throwback to those days. Accompanied by genius songwriter Ed Sheeran, Taylor tells the story of meeting a guy and being instantly infatuated with him. She knows that after this meeting everything’s different now. 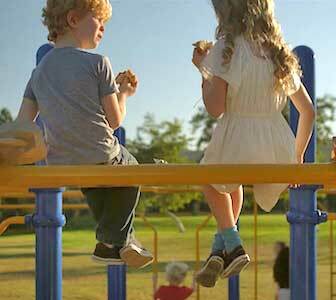 Young Taylor and Ed hanging around on the monkey bars. 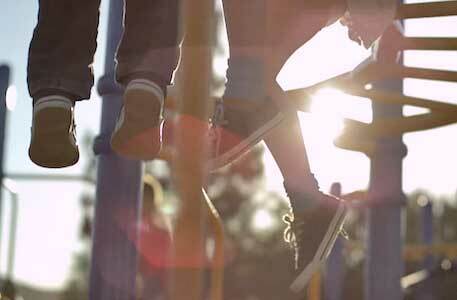 This is demonstrated in the music video by two kids meeting on the bus heading to their first day of school. The kids are meant to look like Swift and Sheeran, and they do with the little Taylor wearing a pair of black and white low top chucks. They slowly become friends and spend the whole day together doing various activities such as arts and crafts, playing guitar, and dancing in the gym. At the end of the day, they’re picked up by their parents: the real Ed Sheeran and Taylor Swift. A close up of Taylor’s chucks in the sun. As stated earlier, young Taylor Swift is wearing a pair of low top black and white chucks which are showcased a few times throughout the video. We see them clearly on the playground and while they’re dancing in the gym. Other kids at the school are wearing chucks as well, but they’re usually lost in the background. Overall, it’s a cute video that fits the song very well, and showcases why Taylor Swift has become the star she is today. Taylor dancing in her chucks.